By Laura. Posted October 22, 2010 at 3:37 pm. 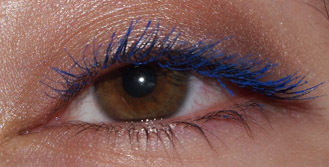 Another thing I recently purchased is Dior DiorShow Mascara in Azure Blue. This is a SERIOUS cobalt blue, people. Now, I have really dark, black-brown lashes, as you can see from my bottom ones. I needed no primer or anything to get the color to show up this vibrantly. It’s freakin’ AWESOME. I don’t really wear any noticeable eyeshadow when I’m rocking this because it steals the show. In this picture I have nothing but a small dab of Urban Decay Sin primer potion on my lids. The formula is good, on the drier side, but it still gives decent volume and length. I usually prefer a slightly wetter formula but I’m not complaining. I’m usually a drugstore mascara purchaser, but with a color payoff like this I can see myself shelling out for this over and over.